We supply four types of software for mechanical contractors which will save you time, money and effort on your takeoffs, estimating, quantity surveying and contract costing. With portability built-in, this software suite is the ideal solution. Save time, effort and money with Mechanical On-Screen Take-Off. This is hands down the quickest and most accurate way to take off tubes, fittings, plant and specials from your electronic PDF drawings. With Mechanical On-Screen Take-Off, you can quickly and easily measure all your parts straight on to the drawing, saving you hours of effort. Produce more accurate measurements for a more accurate quote when you export all quantities to Ensign’s Estimating Software or Excel. There’s no need to print and you can produce emailable takeoffs with ease. For speed and ease of use, Mechanical On Screen TakeOff is your cost saving and portable solution. Win more work in less time with our simple to use and comprehensive mechanical estimating software. Designed to help you make light work of estimating jobs, price updates and average labour norms are included in the database and the user-friendly interface makes fast work of producing that accurate quote. Quickly and easily generate reports to get the best market price on materials or budget effectively for labour costs. Generate bills in seconds, saving time and effort. 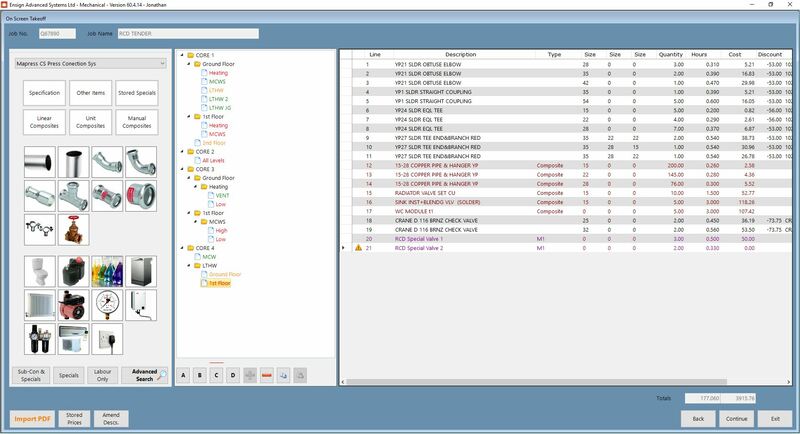 We offer one to one training and bespoke set up to ensure our software accurately meets your needs. Produce comprehensive and clear applications for payment with Ensign Quantity Surveying. Provide the client with the information they need to make payment to you on time and for the correct amount. 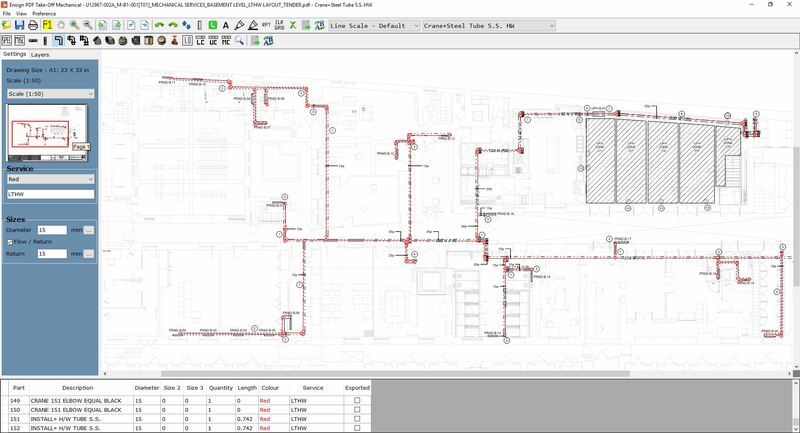 This system integrates seamlessly with Ensign Mechanical Estimating Software for complete consistency and efficiency in variation calculations. Raise hassle-free and timely applications for payment with full breakdowns, ensuring the best possible chance of your payments being made on time without hassle. Stop costs spiralling out of control with the quick and easy to use Ensign Contract Costing system. Track costs to swiftly and effectively manage on-site problems or track clients to maximise job profitability by only tendering for the most profitable jobs. Clear reports are generated on one page for at a glance management of on-site costs and progress to make sure your projects are coming in on time and on budget. 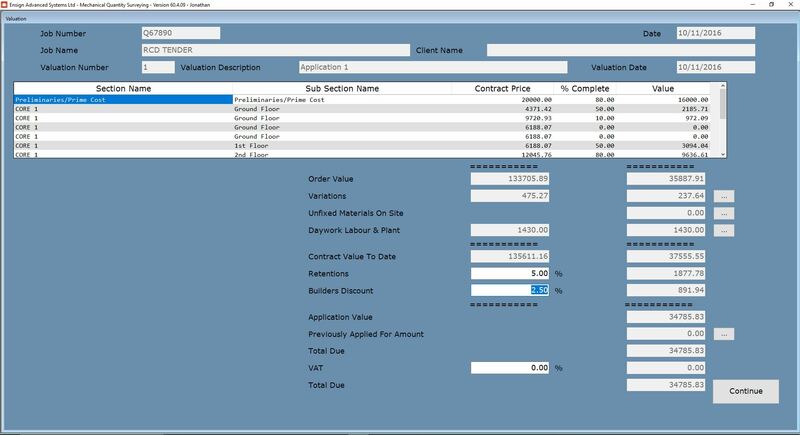 Managing labour, materials and sub-contract costs is simple and efficient with Quickcost.